Of China's 55 officially recognized minority peoples, ten groups are predominantly Muslim. They live in the areas that border Central Asia, Tibet and Mongolia, which is known as the "Quran Belt". The largest groups in descending order are Hui, Uyghur, Kazakh, and Dongxiang. Two deaf Muslim men are having a conversation in sign language, in the shade behind a mosque. A smiling old man is getting ready to pray in the afternoon sun. 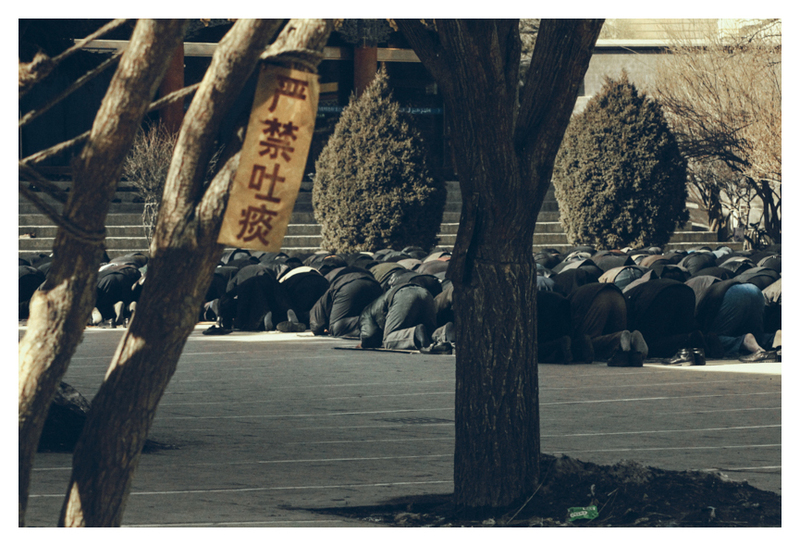 Men kneel down facing Mecca, behind them an often seen Chinese sign that says "prohibited to spit", hanging from the branch of a tree. A man looks through the damp window of the wash room to other men praying. Muslims are required to be clean in preparation for formal prayers. Religious art covers the wall of an Islamic noodle shop in Songpan. Songpan is a county of northwestern Sichuan province, China, and is one of the 13 counties administered by the Ngawa Tibetan and Qiang Autonomous Prefecture. It has a population of approximately 68,000, composed of many different ethnic minorities, such as Tibetan, Qiang, Han and Hui, living together in harmony. China's Muslims are quite unique in their appearance: many of them wear big round retro looking glasses. Keeping a beard is adhere practice according to the Islam, resulting in rather long and thin chin hair with the Chinese. Somebody claimed a spot right next to the aisle on the prayer square outside a mosque by placing his rolled prayer rug in the therefore indicated area. The seemingly contrasting aspects of Islam in China here appear to fuse perfectly. China is not a country often associated with Islam. Yet sources estimate that between 1 and 2% of the total population in China are Muslims, which would be around 100 million people. This means that China has more Muslims than Saudi Arabia, Iraq and Syria combined. 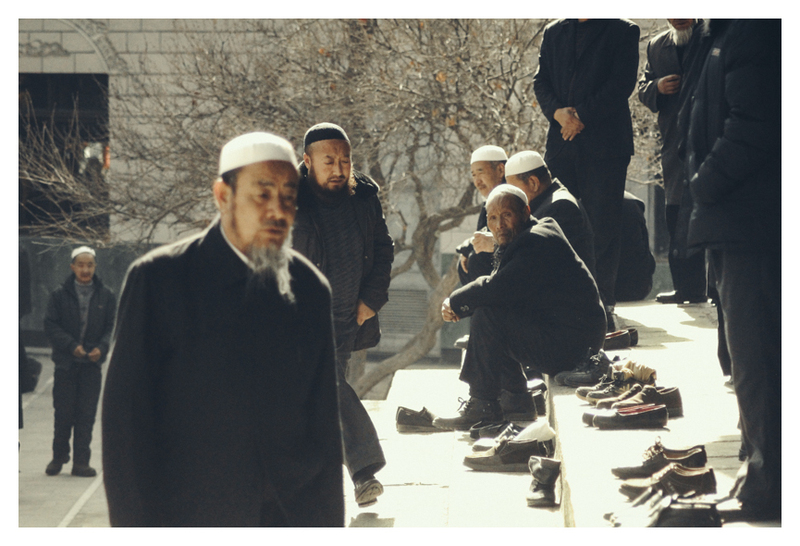 Chinese Muslims have been in China for the last 1,400 years, yet they still aren’t accepted by China and there's an impression that, since the financial crisis, the outside world, and the West in particular, is not so keen to tackle China on its human rights record. During the Cultural Revolution which started in 1966, mosques in China were damaged, demolished or closed by the communist Red Guard groups and copies of the Quran were destroyed. During that time, the government accused Muslims of holding "superstitious beliefs" and promoting "anti-socialist trends". Today, Islam is experiencing a modest revival and there are now many mosques in China. The government began to relax its policies towards Muslims in 1978, but they are still being suppressed in current China with growing frustrations resulting in the catastrophic event on the first of March 2014, now forever called “the Kunming massacre”.